"Music is basically just another language." Waiting For The Snow To Fall chronicles a part of the winter 2002 tour of the band String Cheese Incident. Never heard of them? Well, neither have I, but then, I don't really move in progressive rock-type circles. Focusing on the Rocky Mountain region of the U.S., the band tours locales based around the origins of their sound and style of work. The end result is a documentary that basically embodies precisely what the band wants to be and exactly who their fans are. This is either fantastic or not-too-impressive depending on who you are. To be honest, I fall into the second category. Musically, String Cheese (and their spiritual comrades, like Phish, for example) leave me flat. That said, though, I didn't hold it against the band. Rather, the documentary impressed me with its intimate portrayal of the band as well as a look at the mood and culture of Rocky Mountain towns. The tremendous popularity of the band really surprised me, and after you see their fanatic listeners sell out another location, it truly becomes obvious just how devoted much of the public are to these guys, as well as the whole concept of these small-scale music festivals. That's an interesting aspect of Waiting For The Snow, as it has a sort of honest aspect not normally seen in a lot of modern music chronicles. It should be noted, however, fans of the band won't hear a whole lot of music. Yes, there's a good amount of performance on the disc, but it's actually not as much as one might expect. This isn't so much a concert film as it is a true documentary of the band themselves and the locations they travel to. Much of their philosophy is poured into the mix as well, and it's a more personal portrayal of things rather than just a straight music-only type of presentation. As I said, I'm no fan of the band, but any truly good documentary should, at least in part, transcend the source material and be of some informational or entertainment value to the viewer. In this case, I think Waiting... has succeeded. It allows the viewer to step into the whole independent American West/Southwest music culture without having to be knowledgeable about it. You might not particularly care too much about the band or the music, but the portrayal doesn't come off as egotistical or self-serving, a problem that many band-on-the-road movies can easily slip into. Image Transfer Review: Presumably prepared for high-definition presentation (a guess based on the 1:78:1 aspect ratio), Waiting... comes off as a super-sharp, impressive transfer at near-digitally-perfect quality. While at times this quality differs, it seems to be a direct result of the type of camera used for the particular scene, which is handheld most of the time. No noticeable artifacts or any other image problems appear at any point in the program. Audio Transfer Review: Both the Dolby 2.0 and 5.1 mixes are great quality, but the 5.1 obviously contains a better, more stage-like presence during the performance pieces. Otherwise, since most of the feature is dialogue in the form of interviews and such, the sound need only be clean and well-rendered, which it is. There are no problems of any kind, and the musical portions are extremely well handled with no sound problems. Extras Review: The disc's supplements include some simple cut material that didn't really fit into the main documentary. First, there is a brief reel of skiing bloopers in which the members of the band (who enjoy skiiing) take some brutal tumbles on the slopes. Next, there is a reel of interviews with members of the stage crew and sound engineers. There are two sets of extra interviews with the band: one is more of a humorous approach, whereas the other is an extension of the outdoor interviews contained in the documentary. Fans of the band should like the additional footage, as it helps flesh out stuff in the feature, but had it been included, I think it would have slowed the pace too much. 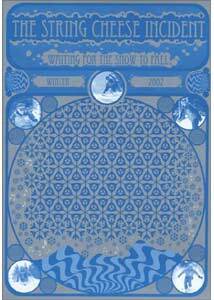 Waiting For The Snow To Fall will definitely appeal to listeners of String Cheese Incident more than anyone else, but that said, it's still a very well made look at a group of artists and their whole approach towards their work, fans and background.